whole-wheat spirals or wagon wheels for the macaroni. In a large skillet, cook beef and onion until meat is browned, about 10 minutes; drain off fat. Stir in undrained stewed tomatoes, tomato sauce, chili peppers, chili powder and cumin; bring to a boil. 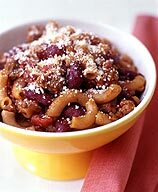 Stir in uncooked macaroni and kidney beans. Return to a boil, reduce heat, cover and simmer until macaroni is tender, about 15 minutes. To serve, spoon into bowls and sprinkle with grated topping. Yields about 1 3/4 cups of chili and 2 tablespoons of topping per serving. Â© 2006 Weight Watchers International, Inc. Â© 2006 WeightWatchers.com, Inc. All rights reserved. WEIGHT WATCHERS and POINTS are the registered trademarks of Weight Watchers International, Inc. and are used under license by WeightWatchers.com, Inc.